90 minutes just isn't nearly enough time to encapsulate the 75+ year history of DC Comics and its iconic characters, but Secret Origin: The Story of DC Comics gives it a heroic effort. Secret Origin is the expected Greatest Hits overview of many of DC's great publishing achievements, along with touching on some of DC's blunders and failures. 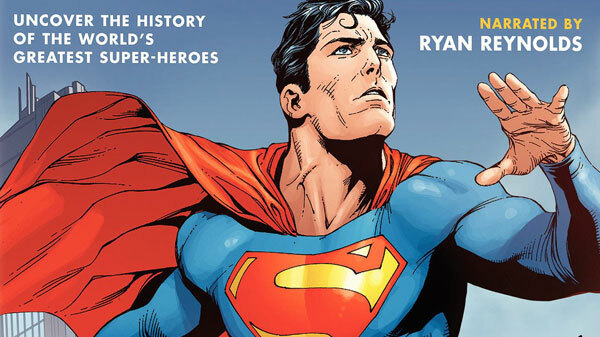 Narrated by Green Lantern Ryan Reynolds, half of the documentary focuses on the founding of the company, the inception of the "Trinity" of icons: Superman, Batman and Wonder Woman, with focuses on Jerry Siegel and Joe Shuster, Bob Kane, and William Moulton Marston, and the trials and tribulations of those initial decades, including World War II, the decline of comics during the 1950s and the persecution of the medium which lead to the creation of the Comics Code Authority. The latter half of Secret Origin picks up both interest and momentum as it Flashes though the Silver Age and Modern Ages of comics: how daring new writers and artists like Denny O'Neil, Neal Adams, Frank Miller, Alan Moore, and Neil Gaiman brought realism, grit, and a brand new audience to DC Comics. The socially relevant comic series "Green Lantern/Green Arrow" and Denny O'Neil's failure to reinvent Wonder Woman in the 1970s (history is repeating itself today) are given special focus. The most recent two decades of publishing are lightly touched on, with no mention of DC's major publishing events like 1985's "Crisis on Infinite Earths" and its sequels. Hilarious how legendary DC editor Julius Schwartz takes partial credit for the success of Marvel Comics via his "Justice League of America" "inspiring" Stan Lee to create the "Fantastic Four". Otherwise, Marvel's prominence is ignored; Jim Lee apparently sprung out of nowhere as the creator of WildStorm Comics with no mention of his making his name with "X-Men" and co-founding Image Comics. An appropriate amount of reverence is given to DC's properties translated successfully to television and feature films: the groundbreaking Max Fleischer Superman cartoons of the 1940s, the George Reeves Superman program of the 1950s, the 1960s Batman TV show, Lynda Carter's Wonder Woman, Superman: The Movie, Tim Burton's Batman, Lois and Clark, Batman: The Animated Series, Batman Begins, The Dark Knight, Watchmen, and Smallville. It's enjoyable to listen to creators like O'Neil, Adams, Len Wein, Neil Gaiman, Alan Moore, Vertigo editor Karen Berger enthusiastically share their love of DC Comics. Perhaps the most fascinating moment was former DC Publisher Jenette Khan bursting into tears when discussing the 1992 "The Death of Superman" storyline. It's still real to them, dammit! For a much more thorough and impressive overview of the history of DC Comics, I highly recommend DC Comics Year By Year: A Visual Chronicle. It's super.